Demaria-Lapierre Dehel folding camera. – John's Cameras. This camera looks very like a 1930s Zeiss Ikon Nettar or Ikonta camera. Looking at the collection-appareils site, there is a chronology of Dehel cameras. Looking at the specific features of my camera – f/3.5 Manar lens, Gauthier shutter, knob film advance, the English writing on the shutter fascia, design of the viewfinder – it would appear to be a 1948 version. 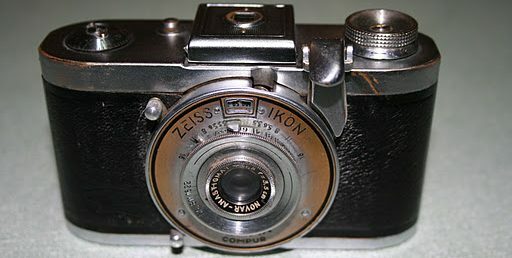 1948 is still fairly soon after the destruction of WWII so it is not surprising to find a French company modernising a 1930s design rather than designing a 1948 camera – Voigtlander and Zeiss Ikon were still producing 1930s designs at this point. A description: well, it’s a medium format folding camera taking 6 x 4.5 cm negatives. Superficially, it looks quite like a Zeiss Ikon Ikonta 520 or Nettar 515 (or Bob 510). The top plate is sparse. Centrally, there is a folding, reverse Newtonian viewfinder. The viewfinder is one of the features with which to date the camera. Early Dehel cameras has a simple wire frame finder. This camera has a moulded, nickel-plated brass, front piece to the finder. The finder is in portrait orientation as the 6 x 4.5 negative is naturally in this mode. However, turning the camera on its side and using your left hand for the shutter release button is easy enough. Turning the other way is possible as well but your right hand fouls the viewfinder. On the front edge of the top plate to the right of the viewfinder is a small nickel-plated button. This releases the lens door for use. The lens door has a fairly hefty spring and puts itself into shooting position but needs an initial helping hand. I suspect that this is an age thing. On the other side of the viewfinder is the shutter release button. This operates through a couple of levers on the shutter release on the shutter housing – very de rigueur since the mid 1930s until internal coupling arrived in the early 1950s. This shutter release button is also nickel plated brass and has a nice large top surface. The lens is a Manar anastigmat with a focal length of 75 mm and a maximum aperture of f/3.5. The front of the camera is plain apart from the lens door. In the centre of the lens door is a folding foot of nickel plated brass. This foot is plain apart from an embossed edge. This is another dating feature as earlier Dehel cameras had the legend “DEHEL” stamped on the foot. When the lens door is opened – it hinges on the left – the shutter/lens assembly is held firmly in place by chromed struts. These struts are very reminiscent of Zeiss Ikon Ikonta 520 struts. To close the lens door you need to press the outer most part of the strut, near the top, towards the body. This partially folds the struts and the door can be pushed up into place. The lens is a Manar anastigmat with a focal length of 75 mm and a maximum aperture of f/3.5. Collection-appareils has the lens as being a triplet. Minimum aperture is f/23 which is a bit strange as f/22 is a standard aperture and the difference between f/22 and f/23 is too small to be worth worrying about. Focus range is from a bit closer than four feet to infinity. The focus scale is in feet, indication an export version. However, this shutter has been modified as it has Demaria-Lapierre’s Autocal feature. This is very neat. The shutter is made by Gauthier – there is no model name indicated but there is the Gauthier logo on the shutter fascia. I think the shutter to be a modified Prontor II. The speed range is from 1 second to 1/250 seconds plus B (but no T). Perceived wisdom (ie the Interweb) says that Prontor II shutters only went to 1/200 in the flash synchronised version but I have seen a Certo Durata camera from the late 1940s with a Prontor II shutter that went to 1/250 seconds. However, this shutter has been modified as it has Demaria-Lapierre’s Autocal feature. This is very neat. The system assumes that you are using 25 ASA film – very slow by today’s standards but common in the 1940s and earlier. This is really a mechanical version of the Sunny 16 rule. There are four windows in the shutter fascia marked ‘Bright sun’, ‘Hazy sun’, ‘Cloudy bright’ and ‘Cloudy dull’. Each of these displays a recommended aperture. As you change the shutter speed these recommended apertures change. Example: At 1/25 seconds shutter speed, the recommended apertures are 16, 11, 8 and 6.3. Changing the shutter speed to 1/100 seconds, the recommended apertures are 8, 6.3, 4.5 and 3.4. A further change in shutter speed too 1/250 seconds gives 6.3, 4.5, 3.5 and ‘NO’ – ‘NO’ indicating that you should not attempt to use 1/250 seconds in cloudy dull weather. As I said – very neat. The shutter also sports a self-timer which barely works – as always, the standard advice is to not use the self-timer on old cameras as you run the risk of wrecking the shutter. The shutter is synchronised for flash with the provision of a PC connector – there is no indication as to whether this is X or M sync. There is no way to connect a cable release – neither on the shutter housing nor on the body release. The bottom of the camera has, at one end, a 1/4 inch Whitworth tripod boss. At the other end of the baseplate is the film advance knob. Again, this helps with dating as earlier models had a film advance key rather than a knob. The back of the camera is plain apart from the red window for reading the frame numbers while advancing the film. This has a metal swivel cover marked ‘MADE IN FRANCE’. Inside, there is little to comment on. The film spools are held in place by springs. There are no spool cradle here nor any devices to locate the spool apart from the key that locates in the end of the take-up spool for turning the spool when advancing the film. The outside of the camera is covered with black leatherette with the metal edges of the body being painted gloss black.